I am an avid believer in the "for real" raw feeding methods - real chicken, beef, pork, turkey, rabbits and/or deer and organ meat, meaty bones and the whole enchilada. Fish too if I can find a good and affordable source for it. Realistically - the benefits are considerably better than "raw out of the bag", as the dogs will get the extra benefit of teeth cleaning and a nice "work-out" while chewing and eating, which they lose when you feed prepared/pre-packaged raw dog food out of the bag. No preservatives at all, no heat/dry treatment - the whole prey method is the "real thing", and I see considerable coat improvements, clean teeth + good breath, and an increased vigor, energy and overall well being, but no hyperness and unlike what many people expect virtually no food fights, aggression or ornery behavior while they are eating, or afterwards for that matter and just for the record - I raw feed app. 30 dogs and 10 cats. Price-wise - when you source your raw meat and meaty bones well, overall speaking, it comes to right about $1/pound or less - and that is well in line with high-end quality commercial dog food, and considerably less than prepared raw dog food out of the bag. 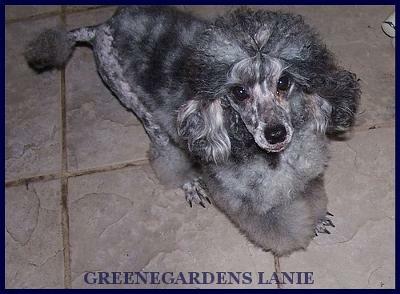 For us here at GreeneGardens, the whole prey method makes for happy and content dogs, puppies + cats in our home and our small miniature poodle kennel. While I do not exclusively raw feed, as many of our pups get placed in kibble feeding homes and need to be prepared for both ways of feeding, it does give them an ultimate good start in life and makes them very flexible for being fed either way. My adults will ignore any type of kibble - no matter how high-end and expensive, LOL - in favor of real meat and bones! Great post, Sabine, really informative! I learned a lot about the whole prey method and particularly appreciate the pricing comparison info. I have used raw pet food over the years but didn't know very much about this method -- thanks so much for sharing such helpful insights about it. Certainly seems to agree with Lanie--she's precious! Just came across this comment I made several years back, and thought I'd give a quickie update when I saw Lanie's photo. Lanie just turned 9 this April  - I want to say she was 3-3.5 yrs in the photo. She virtually looks the same - I keep her shorter now for simplicity, but she shows none of the signs senior dogs usually do. She is active [a matriarch retired from breeding now] and effortlessly keeps up with the young fry. As a matter of fact when you look at her - you can't tell that she is considerably older than most of my other dogs. I definitely blame rawfeeding for that as well as having her on a good multi vitamin [more info about that on my website if you need a picker-upper for your mature dogs]. She still has all of her teeth, her coat grows thick and luscious, she is active and has not slowed down and shows no signs of age related arthritis, pains, etc. Good update, Sabine, thank you. Great to hear, great to know! Really helps to hear about real world experiences of tried and true favorites from others. Many happy, healthy wishes to Ms. Lanie! Join in and write your own page! It's easy to do. How? Simply click here to return to Your Favorite Healthy Dog Foods.